From cooking to baking, sauteing to stir-frying, this high performance canola oil is specially designed for clean, healthy frying! Not only is this oil extremely versatile, but it's also an environmentally-friendly and health-conscious choice. Its reputation as the most nutritious oil has created high demand. In fact, canola oil is currently the third most consumed oil in the world! This canola oil is an excellent multi-purpose ingredient for any establishment, and this 35 lb. container will keep your restaurant or cafe in good supply. Canola oil is crushed, extracted, and refined from harvested canola seeds. What makes it so popular among cooking applications is its neutral taste and high heat tolerance that's suitable for anything, including grilling and frying. It can also be used to make salad dressings, sauces, and marinades. TableTop King Canola Oil - 35 lb. 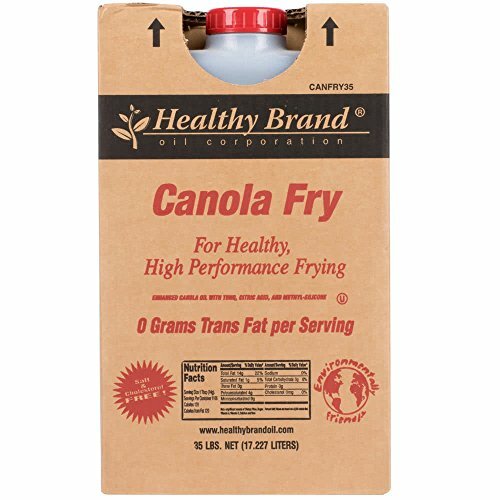 TableTop King Admiration Canola Frying Oil - 35 lb. TableTop King Non-GMO Expeller Pressed Canola Oil - 35 lb. Tomer Canola Oil Kosher For Passover 33.8 Oz. Pack Of 3.